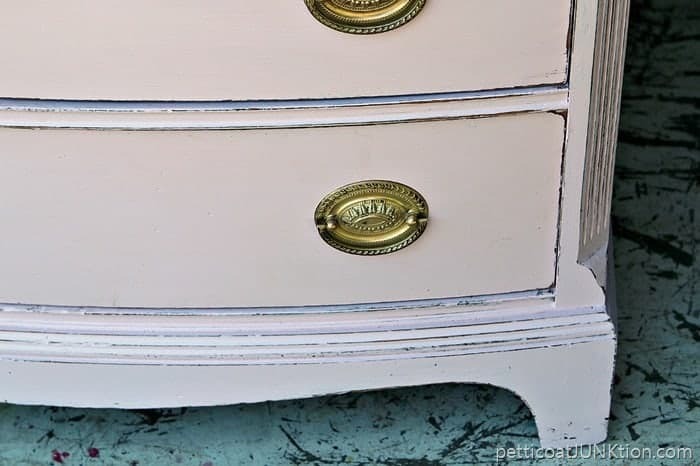 This two tone furniture project combines the original wood finish and barely pink, almost white paint. The contrast is lovely. I wasn’t sure how it would turn out but as I say, “You can always repaint”. 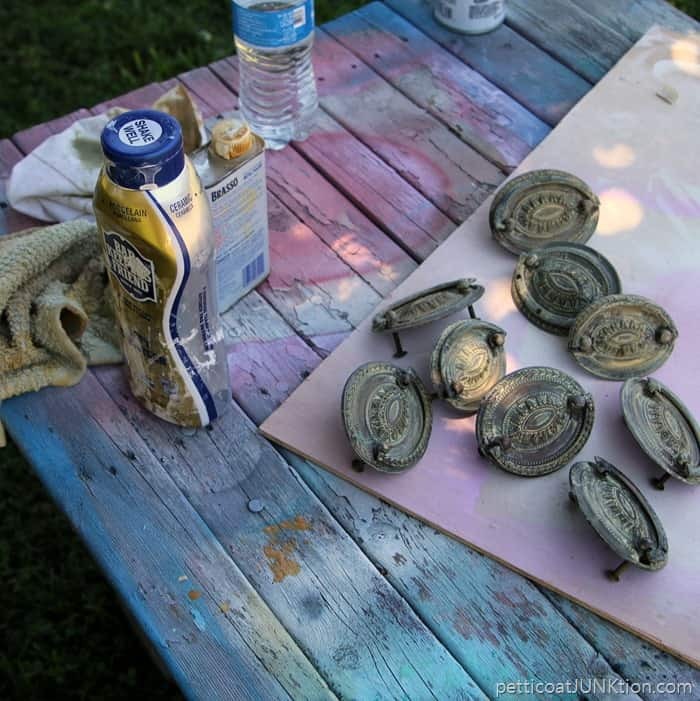 This is a full project tutorial from cleaning to prepping to cleaning hardware to painting. Enjoy. 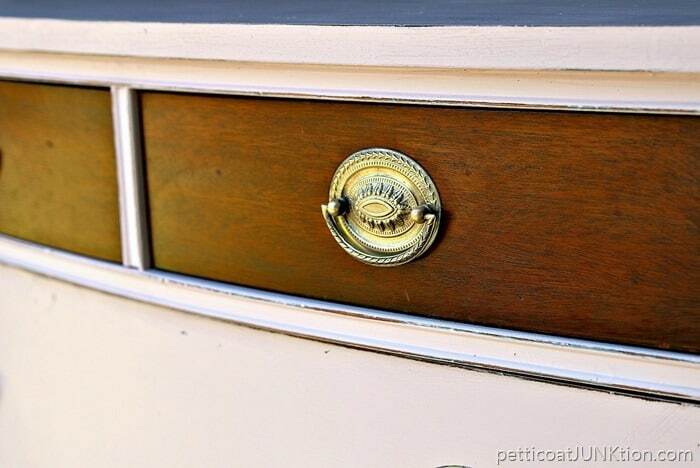 The chest of drawers has a slightly curved front, lovely details, and the original hardware. This is how it looked before. I know a number of you wanted me to refinish the chest, no paint. There were too many issues with the finish so I decided to paint. Sorry. 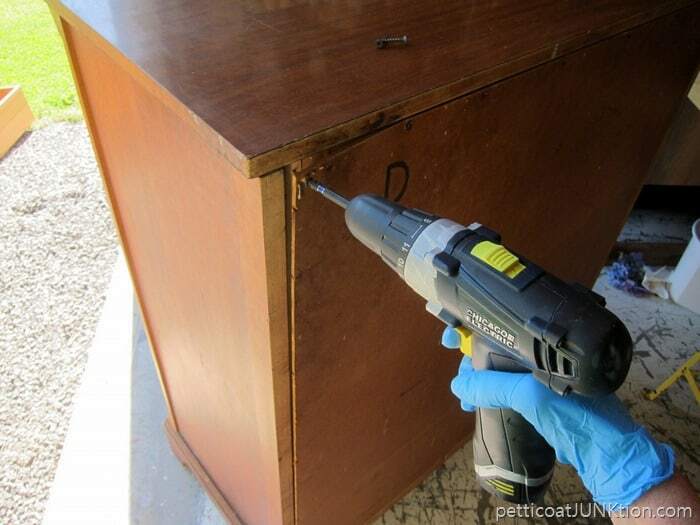 The back of the chest was coming off and the staple gun didn’t do the trick so I had to pull out the drill and a few screws. The chest was really stinky. There was a little bit of white mold in the drawers and the body of the chest. It must have been stored in a damp area. Some furniture odors I can deal with especially with these older pieces but not this odor. I vacuumed and cleaned with simple green but it still smelled. I placed all the pieces out in the sun for two days…and it still smelled. Next I rubbed it down with vinegar. It still smelled only now it smelled like mold…..and vinegar. My next option was to spray it with Febreze. I just started using this product recently with very good results as far as household odors. This isn’t a sponsored post for Febreze. I’m just sharing a product I love. 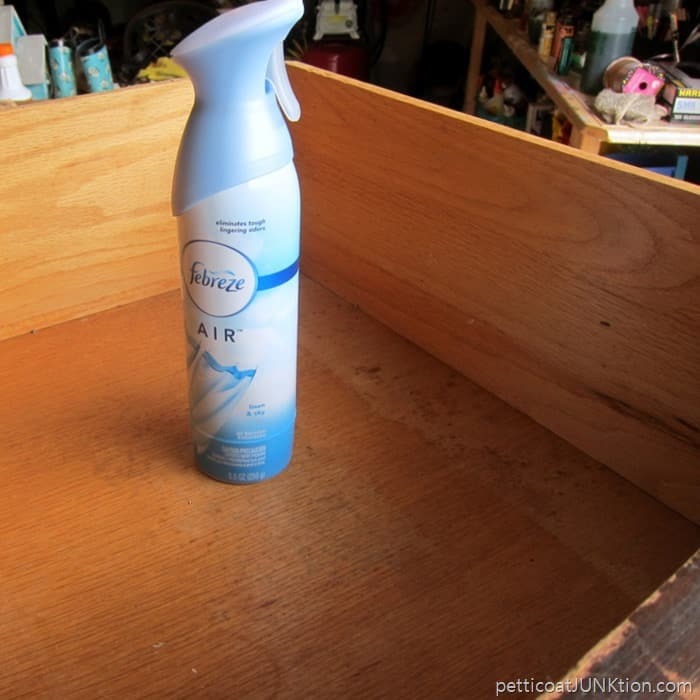 I gets rid of odors in the air it doesn’t just cover them up. So, “Why not try it on my furniture.” I had nothing to lose. I refused to paint the chest until I got rid of the odor. I sprayed the drawers and the body of the chest inside and out. Then I let it set for several days while I was out of town. It worked. The musty, moldy odor is gone. Time to get to work. 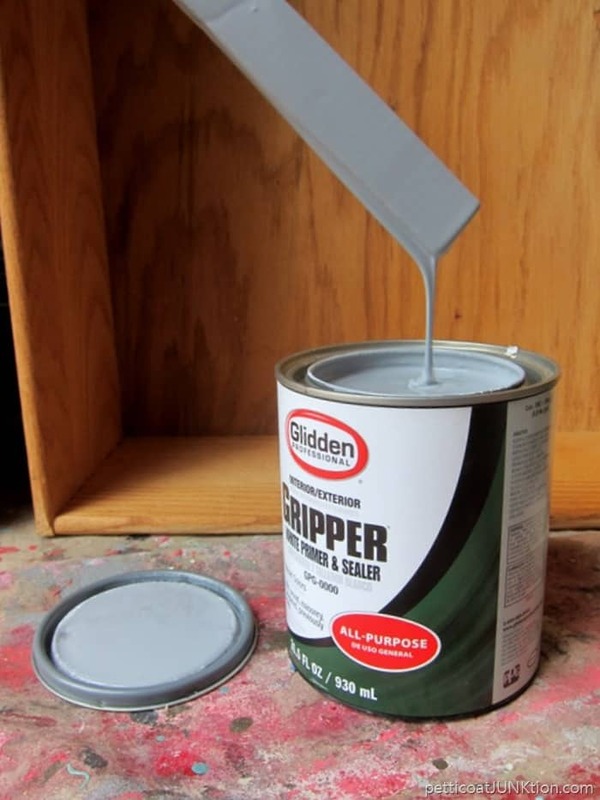 I primed the chest with Glidden Gripper Primer tinted gray. I thought the reddish wood finish might bleed through the paint but I didn’t notice any bleeding. I filed several holes on the top with wood putty. One reason I didn’t consider refinishing the chest is because the top was laminated. Also someone had nailed the top down in places. That was the cause of most of the holes. You guys know I’ve been trying to use the paint I have instead of buying new. I found the pink paint in my stash and it was a little too pinky pink. I added the off-white oops sample pot to the pink. 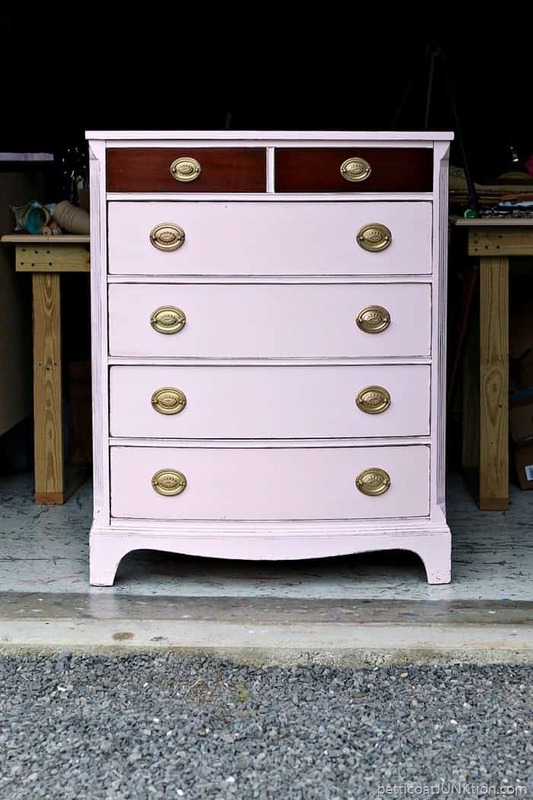 The final paint finish is very, very, light pink or as I like to call it “Barely Pink”. I applied one coat of primer and two coats of Barely Pink. After painting it was time to work on the hardware. I pulled out the Bar Keepers Friend and the JTS (aka hubby, aka, Junktion Technical Specialist) cleaned the hardware. We tried Brasso first but that didn’t work at all. I’m glad he did the job because it took a long while and a lot of patience. The hardware had aged well. A toothbrush comes in handy for this job. While he cleaned the brass hardware I shined the two top drawers with Howard’s Feed n Wax. 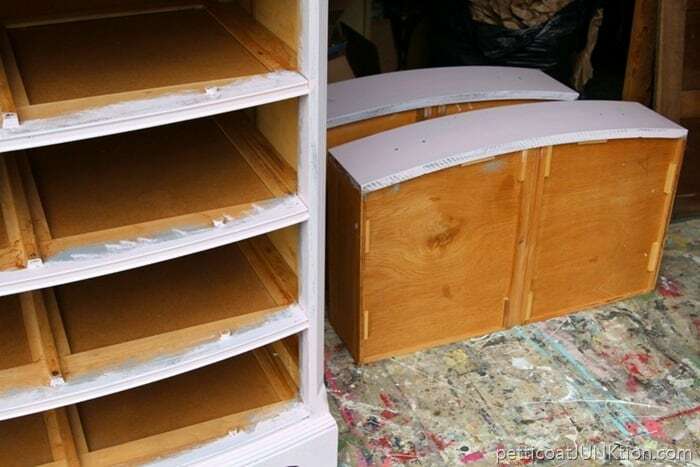 The original finish on the small top drawers was basically scratch free. 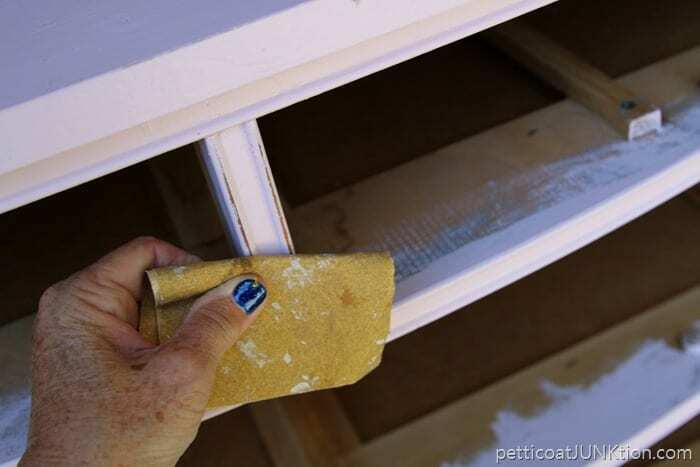 I wasn’t sure how the two tone furniture project would turn out but I could always paint the two drawers. 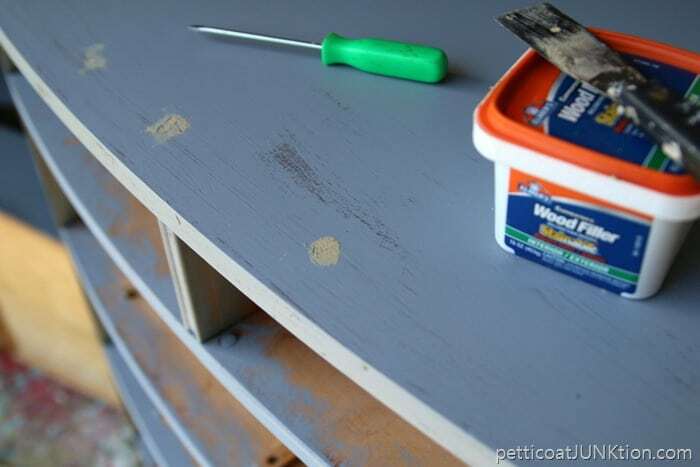 Next I distressed the paint by hand with 100 grit sandpaper. The distressing is very light and just on the raised details and edges of the drawers. Once all the hardware was in place and all of the drawers I took a step back and smiled. Then I did the happy dance. I think the two tone furniture look works. At least for this piece. The newly cleaned brass hardware is sooooo shiny! 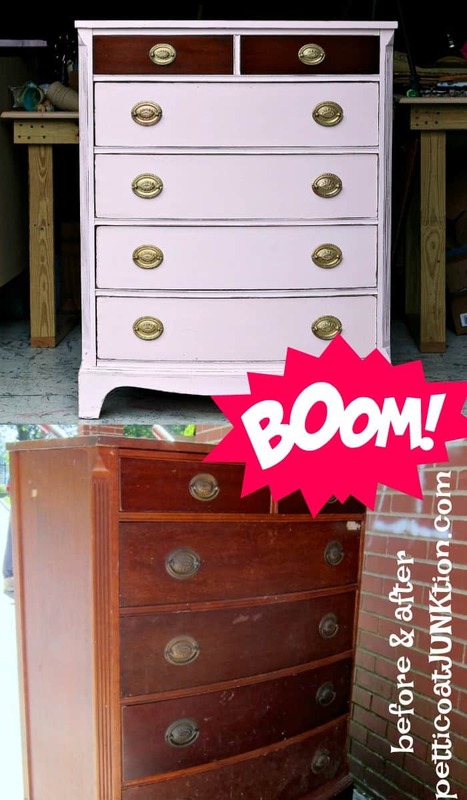 And the original wood finish pops against the barely pink paint. 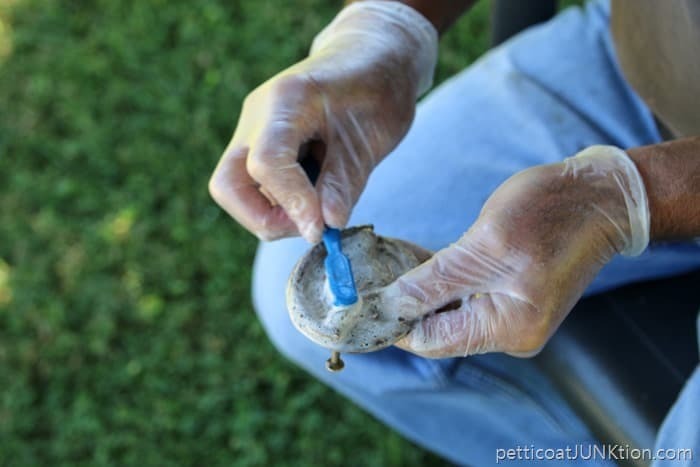 It may be hard to see the pink tint of the paint in these photos. I should have held a bit of white paper up to the paint so you could see the contrast. And that’s my project for today. What do you think? Should I have refinished it even with the laminated top and damaged areas or do you like the new look? 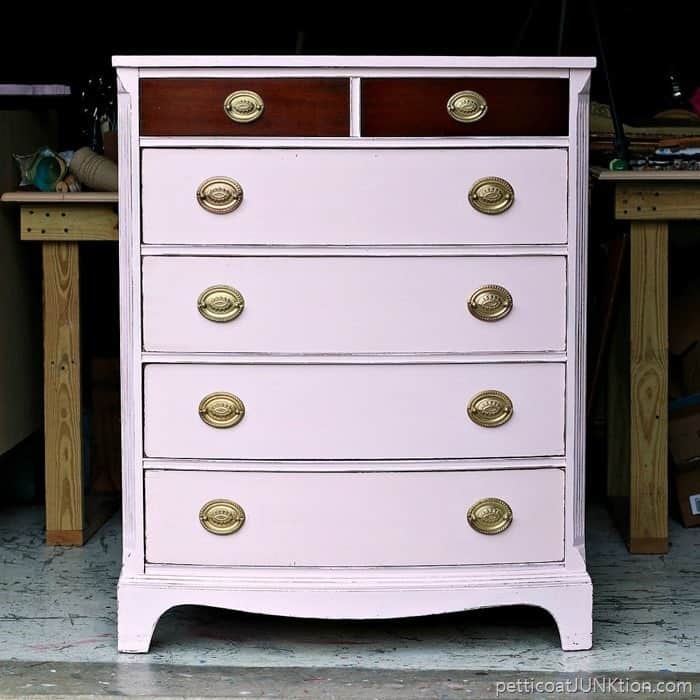 I painted this pretty pink chest…..all over pink….see it here….Miss Pink Cotton Candy. Let me know your thoughts and have a great day. Really gorgeous Kathy; I love that pink color! You did a beautiful job. You always know the right thing to do to bring out the best in a piece. 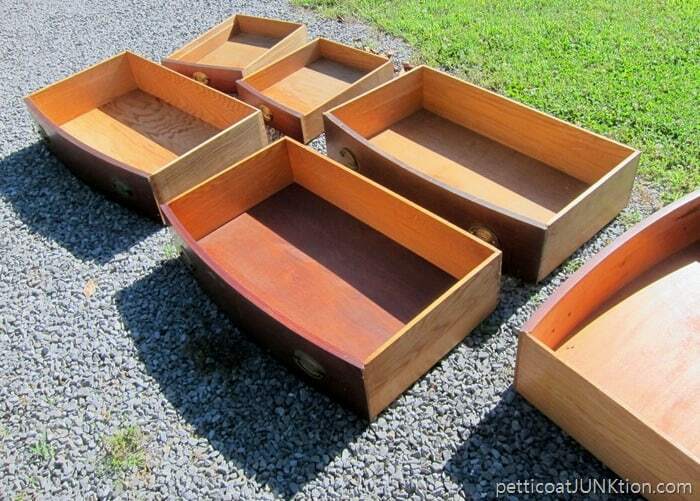 I really like the top drawers left natural….great contrast. Always looking for ideas for a piece that I need to do. Me like!! It looks so classy ad unique that it would fit in many decor situations. 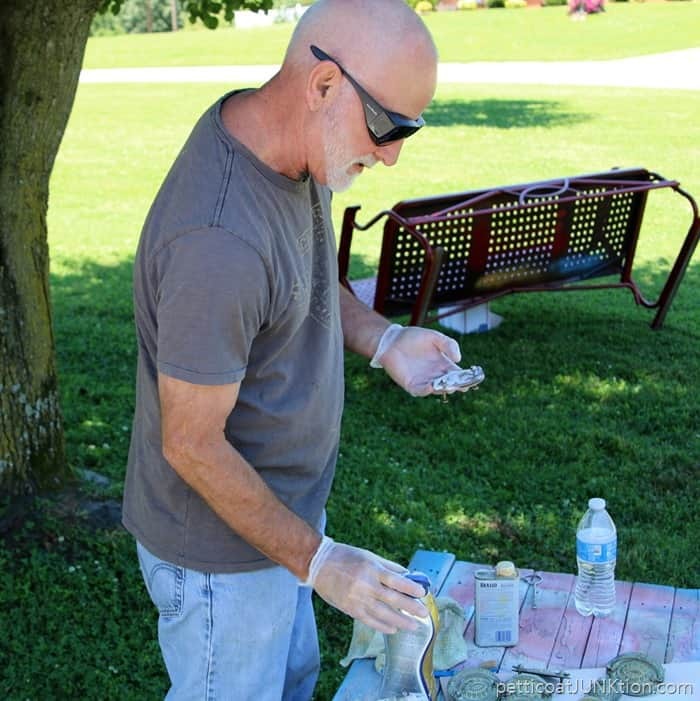 And I see your glider getting a paint job, too looking forward to seeing how that turns out! Oh my gosh !!! I love this! Probably my most favorite piece you’ve done. Love to have it!! Love it! Great make over. Thanks for sharing your techniques. Love learning how to re-purpose, re-use and recycle. Not a fan of the two-tone, but I really love the brass handles! The paint is a lovely color. I like the 2 time look. It turned out great. 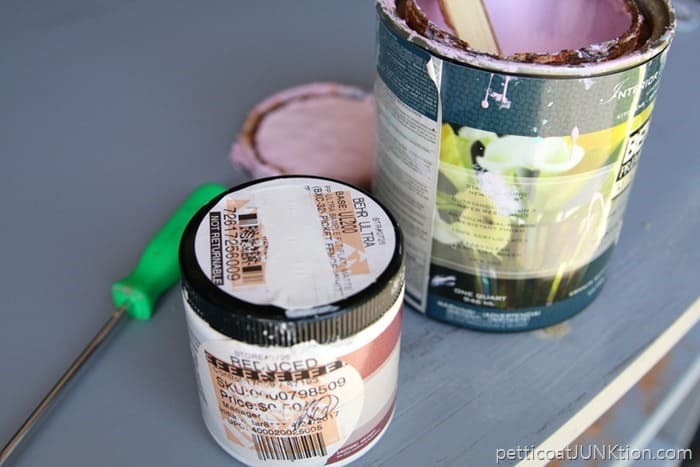 Did you put a sealer or anything over the pink paint? This combination is truly beautiful and very original. Your very hard work was certainly worth it – a complete transformation. I envy you for having this piece. Fabreeze huh! Must remember this for my next stinky piece. Love the stained and painted look. I can see this barely pink dresser going into a lucky girl’s room or feminine bedroom. Very pretty – pinned. I think painting it was the best way to go. I like the two-tone look but I would want something else in the room in the same or similar wood tone to the drawers. Love the slight curve on the drawers! Love the two tone otherwise it would of been… well just pink. 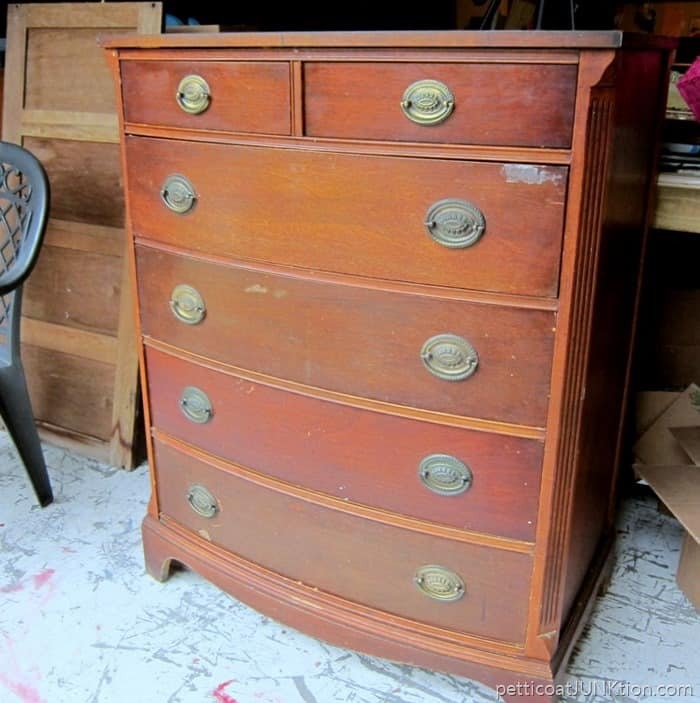 I love it and especially the 2 top drawers left with the wood color. The hardware is my absolute favorite style and JT did it proud. As always, to me, your work is always so right, so on touch with each furniture piece you do, that you always amaze me with your talent! I call you the “Furniture Whisperer” because it seems like you and whatever piece you are doing seem to communicate to each other. The piece is beautiful and the two tone is perfect!!! The combinations with paint are endless and you can make a piece shine by bringing out it’s personality and your own. So kudos to you!!! It looks great! Absolutely Beautiful, Great Job, ? Great Job! I love pink furniture. Yours is even better with two tones. Could you tell me exactly what was used for cleaning the hardware? I enlarged the pic with your hubby and it looks like Brasso. But you said something about bar keepers friend. Thanks! HI, Diane. 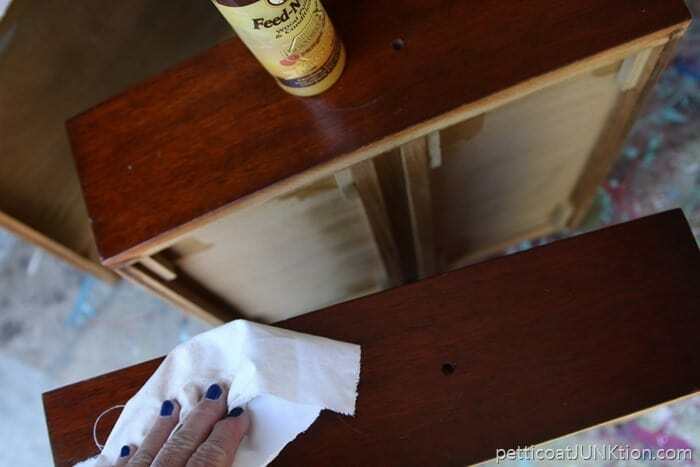 In the photo, her husband has his hand on the liquid version of Bar Keepers Friend he used on that hardware. It also can be found in powdered form. It works on all types of clean ups in the house & cleaning vintage items. I love it for scouring dirty old pottery & china. It takes utensil marks off dishes for me. Kathy, You did it Again! What a wonderful unique piece of furniture. I think this one should be in my House! Love Love Love as always you are spot on! I would never have thought to do it this way and I think it is lovely! why didn,t you paint the top drawer? I love the two tones! It is a beautiful piece. Well done!